Acting as a liaison between Customers and Service department, the Service Advisors are involved right from greeting customers to service explanation. The Service Advisor Resume gives a glimpse of the various job tasks undertaken by these advisors, and such tasks include – greeting customers on arrival, identifying the customer’s need, connecting customer with appropriate department, consulting with mechanics, developing feasible solutions, explaining various service options, providing in-depth information, giving warranty details to customers, tracking repair or maintenance status, performing post-service inspection, drafting invoice, and collecting payments from customers. 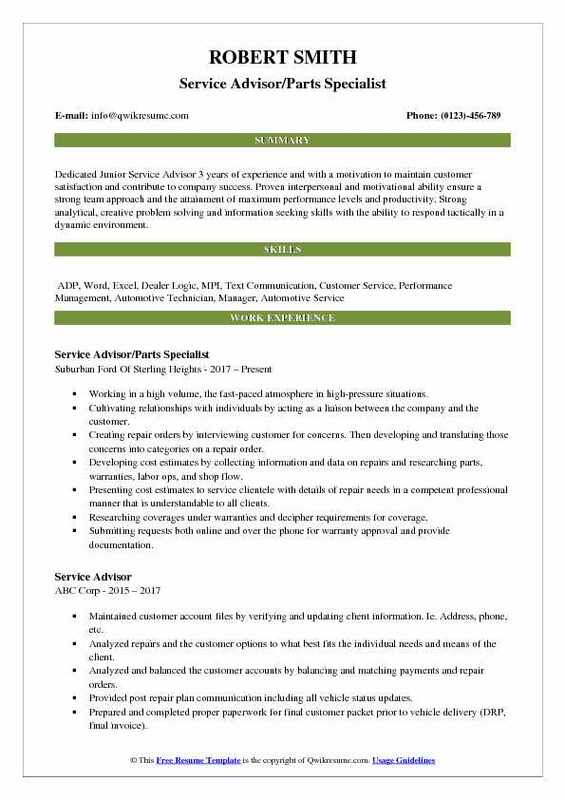 To execute the job description, the Service Advisors need the following skillset – excellent communication and interpersonal skills, compassionate and patient demeanor, the ability to explain complex concepts in simple terms to customers, and extensive knowledge of industry’s operation and critical thinking capacities. Formal education is not mandatory, as a high school diploma along with industry based experience will substantiate academic requirement. 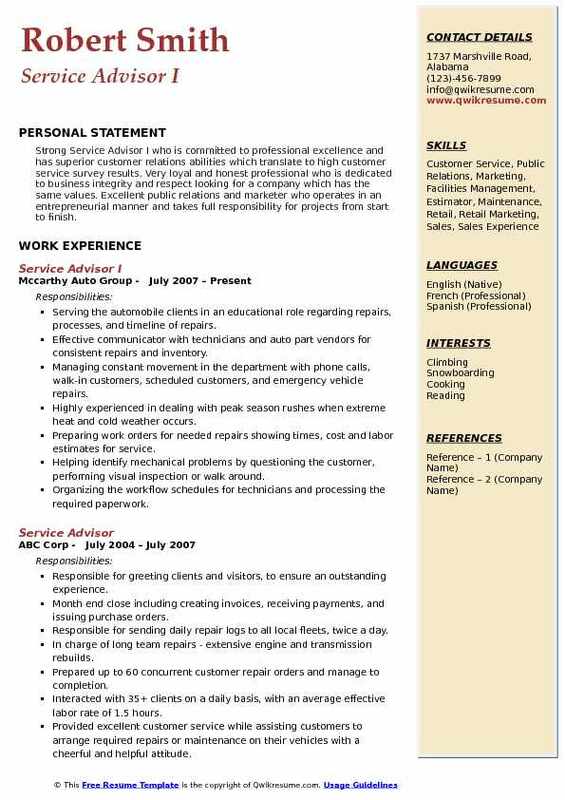 Summary : Outgoing automotive Senior Service Advisor with 8+ years of parts and service experience. Friendly and resourceful with strong listening skills and the ability to ask the right questions to assist technicians with diagnosis. Effectively builds loyal and long-term relationships with customers. Preparing daily work orders for the day for customers for daily service appointments. Greeting customers as they arrive at the dealership for automotive appointments. Moving customers vehicles to the location in the shop for repairs and routine maintenance on vehicles. Keeping accurate and detailed documentation for customers current repairs and future repairs. Answering incoming calls to the dealership, transfer phone calls to other employees and correct departments. Answering any customer questions on repairs and problem solving if needed. Setting up new appointments in the service department for future customer repairs. Working closely with certified technicians in the shop area on the diagnosis the customer's vehicle with any failures and needed repairs. Working closely over the phone and in person with warranty companies in getting prior approval for repairs to customer's vehicles. Headline : A high energy and results-driven Client Service Advisor with over seven years of experience in the Insurance industry. A dedicated supervisor with the ability to obtain outstanding results in a challenging environment. Strong research and problem-solving skills, able to take ambiguous and complex assignments and break them into action items yielding short and long-term results. 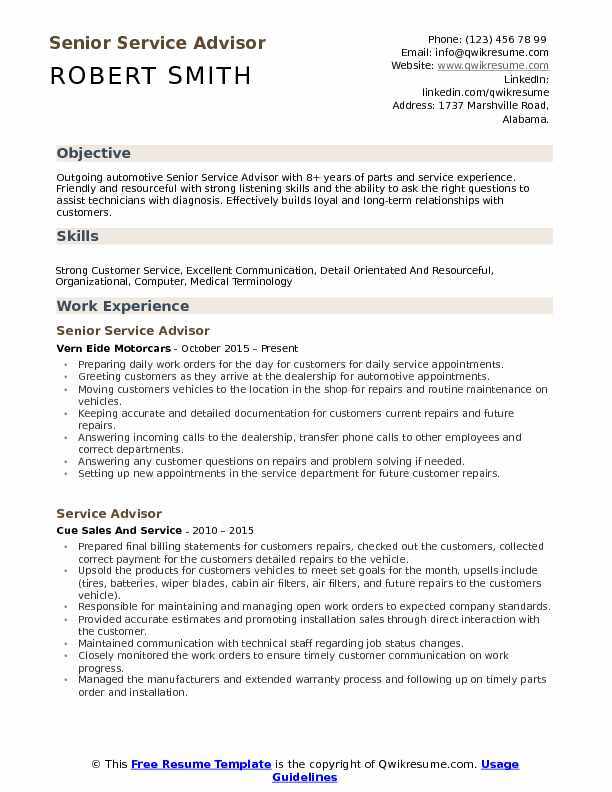 Skills : Effective Communication And Conflict Resolving, Customer Relations, Accurate Estimating And Time Management. Coordinating/facilitating the role-based training for new hires and seasoned employees; partner areas that perform like processes/tasks, and resource fluidity support. Auditing/measuring the quality of work produced during role-based training. Evaluating the trends to identify gap training needs, continuous improvement and process procedures updates. Partnering with the training program to develop learning materials, CBTs and tools needed. Evaluating the QA program results/trends to determine root cause and opportunities for process improvement, system enhancement or gap training needs. Identifying the audit items for quality audit program where no systemic ability is available. Supporting the Manager through lean management process through conducting a supplemental audit to assess customer experience or to evaluate potential performance issues. Documenting, creating and delivering the formal communications/ presentations of findings to internal/ external audiences. Effectively influencing the peers, partners, and leaders through an understanding of up/downstream impacts to problem resolution through a focus on the customer experience. 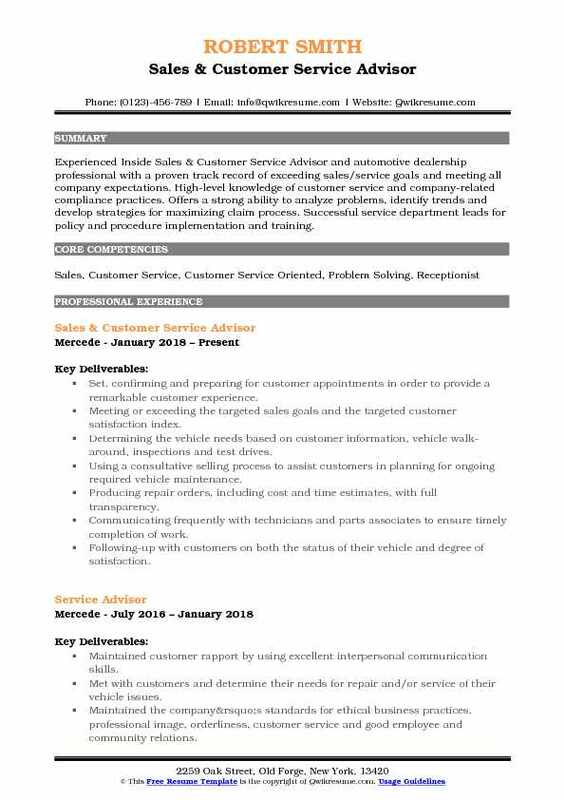 Objective : Dedicated Junior Service Advisor 3 years of experience and with a motivation to maintain customer satisfaction and contribute to company success. Proven interpersonal and motivational ability ensure a strong team approach and the attainment of maximum performance levels and productivity. Strong analytical, creative problem solving and information seeking skills with the ability to respond tactically in a dynamic environment. Working in a high volume, the fast-paced atmosphere in high-pressure situations. Cultivating relationships with individuals by acting as a liaison between the company and the customer. Creating repair orders by interviewing customer for concerns. Then developing and translating those concerns into categories on a repair order. Developing cost estimates by collecting information and data on repairs and researching parts, warranties, labor ops, and shop flow. Presenting cost estimates to service clientele with details of repair needs in a competent professional manner that is understandable to all clients. Researching coverages under warranties and decipher requirements for coverage. Submitting requests both online and over the phone for warranty approval and provide documentation. Coordinating payments from warranty companies and post them to the correct customer accounts. 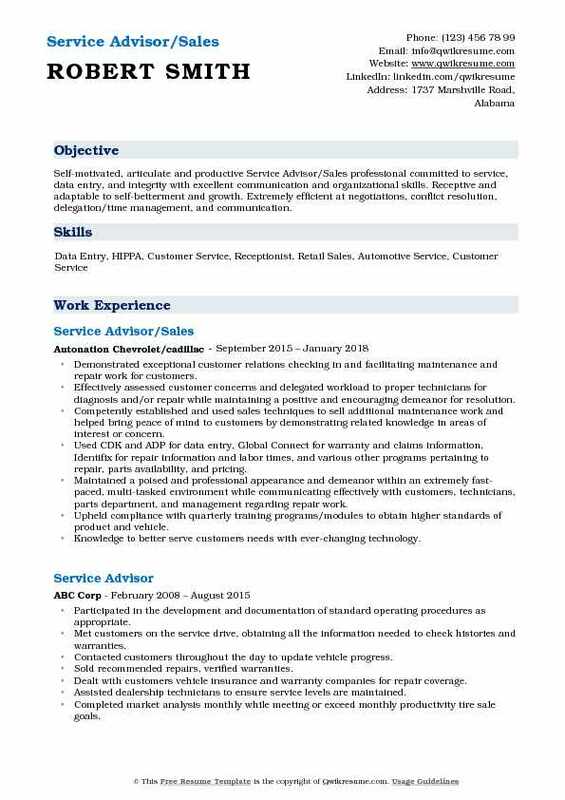 Summary : Automotive Service Advisor with 14 years of experience in the Automotive industry. Looking to obtain a position that will allow me to utilize my professional experience, superior customer service skills and knowledge of the automotive industry, with an organization that rewards and expects superior performance. 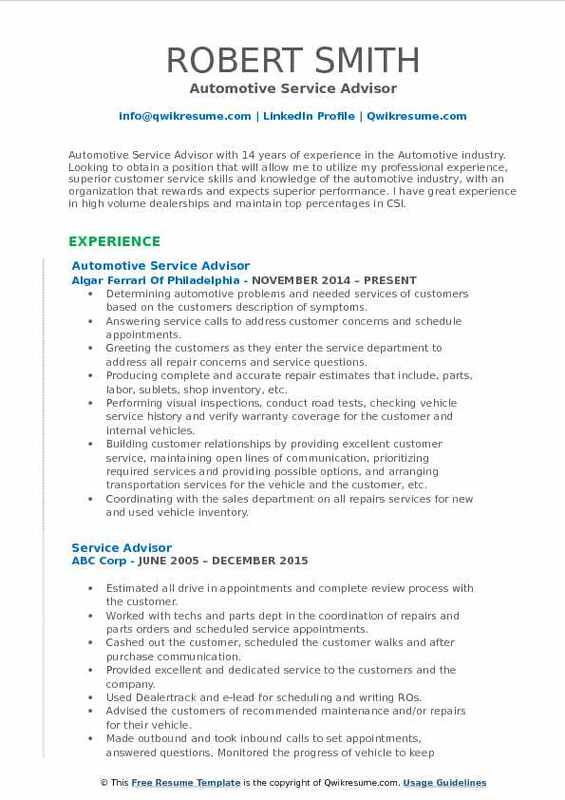 I have great experience in high volume dealerships and maintain top percentages in CSI. Determining automotive problems and needed services of customers based on the customer's description of symptoms. Answering service calls to address customer concerns and schedule appointments. Greeting the customers as they enter the service department to address all repair concerns and service questions. Producing complete and accurate repair estimates that include, parts, labor, sublets, shop inventory, etc. Performing visual inspections, conduct road tests, checking vehicle service history and verify warranty coverage for the customer and internal vehicles. Building customer relationships by providing excellent customer service, maintaining open lines of communication, prioritizing required services and providing possible options, and arranging transportation services for the vehicle and the customer, etc. Coordinating with the sales department on all repairs services for new and used vehicle inventory. Delegating work to technicians based on knowledge, skill, and difficulty of repair. Selling extended warranties, deal with storage contracts and billing, sell advise customers about accessories. Participated in Ferrari training courses, keeping up to date on technical bulletins, and recall and service campaigns. 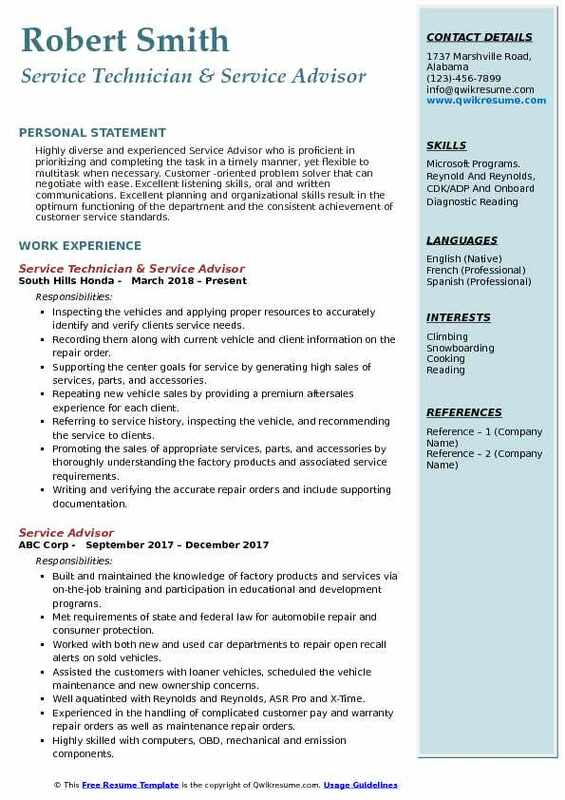 Objective : Highly diverse and experienced Service Advisor who is proficient in prioritizing and completing the task in a timely manner, yet flexible to multitask when necessary. Customer -oriented problem solver that can negotiate with ease. Excellent listening skills, oral and written communications. Excellent planning and organizational skills result in the optimum functioning of the department and the consistent achievement of customer service standards. Inspecting the vehicles and applying proper resources to accurately identify and verify clients service needs. Recording them along with current vehicle and client information on the repair order. Supporting the center goals for service by generating high sales of services, parts, and accessories. Repeating new vehicle sales by providing a premium aftersales experience for each client. Referring to service history, inspecting the vehicle, and recommending the service to clients. Promoting the sales of appropriate services, parts, and accessories by thoroughly understanding the factory products and associated service requirements. Writing and verifying the accurate repair orders and include supporting documentation. Administering new and used vehicle warranty repairs in accordance with warranty specifications. Ensuring requested vehicle services are performed correctly upon completion by inspecting the vehicle prior to each service delivery. Summary : Self-motivated, articulate and productive Service Advisor/Sales professional committed to service, data entry, and integrity with excellent communication and organizational skills. Receptive and adaptable to self-betterment and growth. Extremely efficient at negotiations, conflict resolution, delegation/time management, and communication. Demonstrated exceptional customer relations checking in and facilitating maintenance and repair work for customers. Effectively assessed customer concerns and delegated workload to proper technicians for diagnosis and/or repair while maintaining a positive and encouraging demeanor for resolution. Competently established and used sales techniques to sell additional maintenance work and helped bring peace of mind to customers by demonstrating related knowledge in areas of interest or concern. Used CDK and ADP for data entry, Global Connect for warranty and claims information, Identifix for repair information and labor times, and various other programs pertaining to repair, parts availability, and pricing. Maintained a poised and professional appearance and demeanor within an extremely fast-paced, multi-tasked environment while communicating effectively with customers, technicians, parts department, and management regarding repair work. Upheld compliance with quarterly training programs/modules to obtain higher standards of product and vehicle. Knowledge to better serve customers needs with ever-changing technology. Consistently met targeted sales goals at a 90% rate or higher while exceeding benchmark for CSI every month. 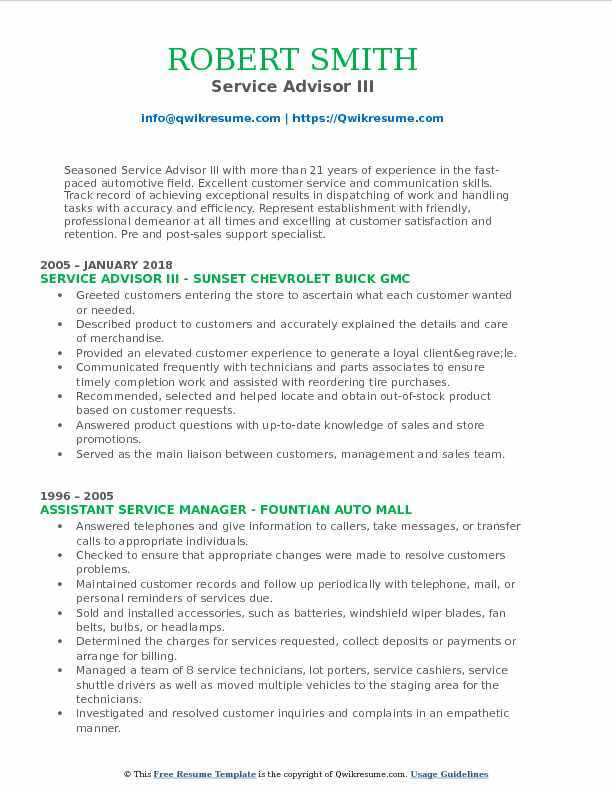 Summary : Seasoned Service Advisor III with more than 21 years of experience in the fast-paced automotive field. Excellent customer service and communication skills. Track record of achieving exceptional results in dispatching of work and handling tasks with accuracy and efficiency. Represent establishment with friendly, professional demeanor at all times and excelling at customer satisfaction and retention. 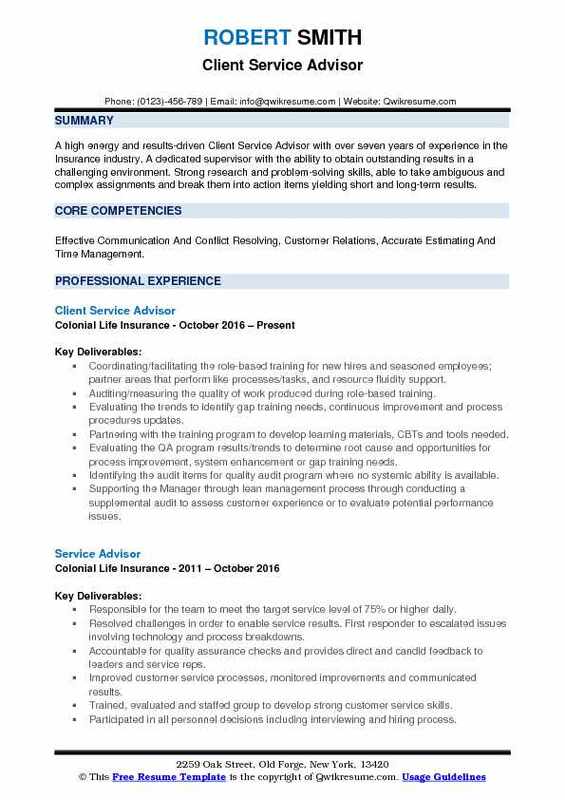 Pre and post-sales support specialist. Described product to customers and accurately explained the details and care of merchandise. Communicated frequently with technicians and parts associates to ensure timely completion work and assisted with reordering tire purchases. Contacted customers to upsell new services for their service vehicle needs. Wrote a brief description of the problems on the repair order to help mechanic locate the problem. Objective : Experienced Inside Sales & Customer Service Advisor and automotive dealership professional with a proven track record of exceeding sales/service goals and meeting all company expectations. High-level knowledge of customer service and company-related compliance practices. Offers a strong ability to analyze problems, identify trends and develop strategies for maximizing claim process. Successful service department leads for policy and procedure implementation and training. Set, confirming and preparing for customer appointments in order to provide a remarkable customer experience. Meeting or exceeding the targeted sales goals and the targeted customer satisfaction index. Determining the vehicle needs based on customer information, vehicle walk-around, inspections and test drives. Using a consultative selling process to assist customers in planning for ongoing required vehicle maintenance. Producing repair orders, including cost and time estimates, with full transparency. Communicating frequently with technicians and parts associates to ensure timely completion of work. Following-up with customers on both the status of their vehicle and degree of satisfaction. Providing superior product knowledge to effectively assist customers and assure customer loyalty. Inspecting the completed vehicle, with the passenger, explaining services performed, as necessary. Consulting with customers about inspection results, recommending corrective procedures. Summary : Strong Service Advisor I who is committed to professional excellence and has superior customer relations abilities which translate to high customer service survey results. Very loyal and honest professional who is dedicated to business integrity and respect looking for a company which has the same values. Excellent public relations and marketer who operates in an entrepreneurial manner and takes full responsibility for projects from start to finish. Serving the automobile clients in an educational role regarding repairs, processes, and timeline of repairs. Effective communicator with technicians and auto part vendors for consistent repairs and inventory. Managing constant movement in the department with phone calls, walk-in customers, scheduled customers, and emergency vehicle repairs. Highly experienced in dealing with peak season rushes when extreme heat and cold weather occurs. Preparing work orders for needed repairs showing times, cost and labor estimates for service. Helping identify mechanical problems by questioning the customer, performing visual inspection or walk around. Organizing the workflow schedules for technicians and processing the required paperwork. Continuously increasing personal knowledge by taking manufacturer provided education. Providing excellent customer service and developed long-standing client relationships with repeat business. 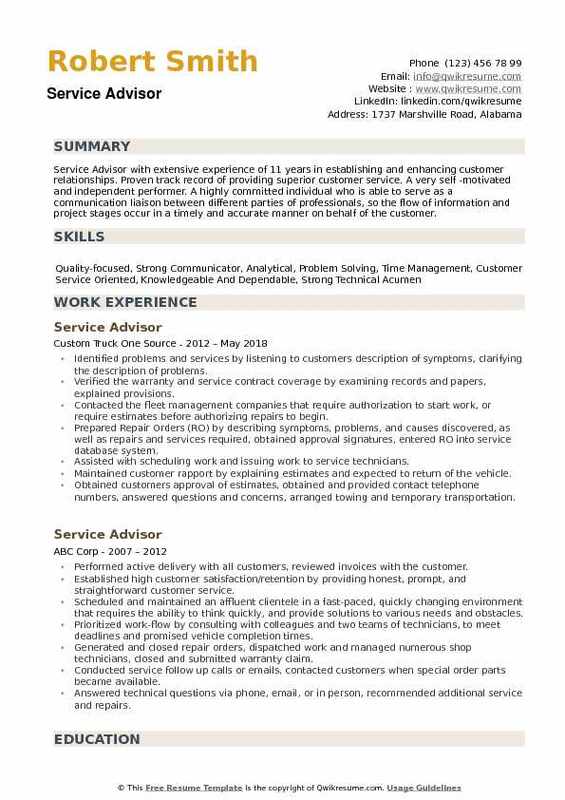 Summary : Service Advisor with extensive experience of 11 years in establishing and enhancing customer relationships. Proven track record of providing superior customer service. A very self -motivated and independent performer. A highly committed individual who is able to serve as a communication liaison between different parties of professionals, so the flow of information and project stages occur in a timely and accurate manner on behalf of the customer. Identified problems and services by listening to customers description of symptoms, clarifying the description of problems. Verified the warranty and service contract coverage by examining records and papers, explained provisions. Contacted the fleet management companies that require authorization to start work, or require estimates before authorizing repairs to begin. Prepared Repair Orders (RO) by describing symptoms, problems, and causes discovered, as well as repairs and services required, obtained approval signatures, entered RO into service database system. Assisted with scheduling work and issuing work to service technicians. Maintained customer rapport by explaining estimates and expected to return of the vehicle. Obtained customers approval of estimates, obtained and provided contact telephone numbers, answered questions and concerns, arranged towing and temporary transportation. Communicated with the parts department to determine and locate part numbers for units.